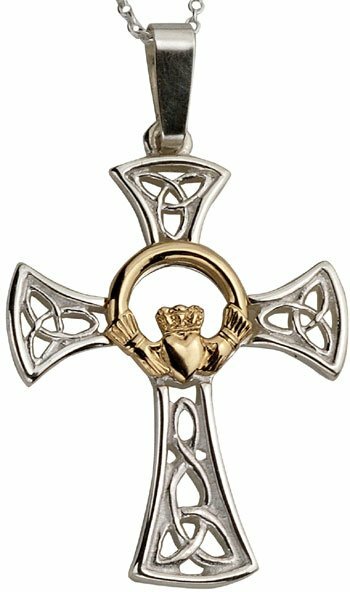 Handcrafted Traditional Celtic cross in silver and gold with Claddagh and trinity knot detail. Wonderful detailing incorporating the Claddagh symbol and trinity knot designs showcases the best of Irish craftsmanship. This sterling silver and 10k yellow gold Celtic Cross is handcrafted in Dublin and hallmarked at the Irish Assay Office. Measuring 35mm high (inc. bale) and 14mm wide, the cross is fitted with an 18 inch silver chain. Guaranteed Irish jewelry with free shipping from Ireland.